His white teacher tells her all-black class, You'll all wind up porters and waiters. What did she know? 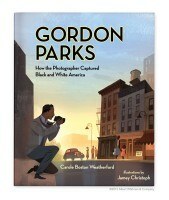 Gordon Parks is most famous for being the first black director in Hollywood. But before he made movies and wrote books, he was a poor African American looking for work. When he bought a camera, his life changed forever. He taught himself how to take pictures and before long, people noticed. His success as a fashion photographer landed him a job working for the government. In Washington DC, Gordon went looking for a subject, but what he found was segregation. He and others were treated differently because of the color of their skin. Gordon wanted to take a stand against the racism he observed. With his camera in hand, he found a way. Told through lyrical verse and atmospheric art, this is the story of how, with a single photograph, a self-taught artist got America to take notice.